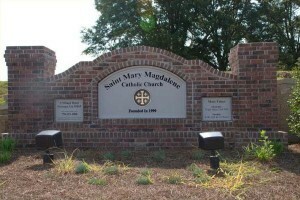 2009 marked St. Mary Magdalene Catholic Church’s 10 year anniversary as a community. We celebrated this exciting anniversary with a season of special festivities that included our annual parish Mass and picnic, an All Saints parade, and a memorable prayer breakfast. In 15 short years we have grown from a modest mission – with 218 people in attendance at our initial Mass – to a thriving faithful community, lead by our pastor Father Terry Crone, of now over 1,000 families and 54 active ministries. We are located in the eastern portion of Coweta County, approximately 25 miles south of the Atlanta airport. We are a diverse, active, and growing parish. We offer three weekend Masses – 5:00 p.m. Saturday, and 9:00 a.m and Noon on Sunday. Both of our Sunday liturgies have a children’s offertory — whereby, the children of our parish are encouraged to use special envelopes to write down some of the wonderful ways they have practiced their faith over the previous week. Fr. Terry invites the kids forward during these Masses to place these envelopes of true “offering” into the offertory basket. In the fall of 1999, the Archdiocese of Atlanta directed the creation of a Catholic mission in the rapidly growing area of Sharpsburg, Ga. Under the guidance of Father John Walsh, pastor of Holy Trinity in Peachtree City, the Sharpsburg Catholic Mission was born. 218 people, representing 62 families gathered at Thomas Crossroads Elementary School to celebrate the mission’s first Mass. Something remarkable began that day and the seeds of an active and enthusiastic spirit was planted. A short time later the archdiocese found and acquired 40 acres of land on Lower Fayetteville Road in Sharpsburg. The new property included a house, which today serves as a rectory, and an old rustic barn. Preliminary plans for the property included a worship space, parish hall, and space for religious education. In June of 2000, our mission was assigned its first administrator by the archdiocese. Father Joseph Morris was introduced at the first outdoor Mass on the new property on June 25, 2000. Many changes began to occur around the new property. The house was renovated and the surrounding grounds cleaned and manicured. Additionally, an experienced group of volunteers tackled the project of transforming the unfinished basement into a day chapel and some much needed office space. As our weekly congregation began to grow it became clear that our mission needed a larger worship space. In August of 2000, we moved our weekly Mass to the cafeteria inside East Coweta High School (ECHS). Our Parish Religious Education Program (PREP) was launched one month later. Our PREP program began as kindergarten thru eighth grade and also included Rite of Christian Initiation for both adults and children. Classes were held at ECHS on Sundays after Mass. On Christmas Day 2000, the archdiocese officially renamed our faith community “St. Mary Magdalene Catholic Mission.” 2001 was a tremendously busy year for our new mission. Thanks to the generous support of our neighbors at Cokes Chapel United Methodist Church, we added a Saturday evening Vigil Mass inside their worship space. Additionally, we offered our first Holy Week services in April. The memorable Holy Week liturgies were celebrated on the mission property — in the barn. And, later that month our first class of PREP students celebrated their First Communion. On January 31, 2002 Father Dan Fleming was appointed as our new leader and administrator. To celebrate the earlier completion of the base of operations for our parish, in March of 2002, the day chapel was blessed, and dedicated. Due to continued growth we eventually moved our Saturday evening Mass from Cokes Chapel to East Coweta High School. By the fall of 2003, our development and growth was continuing at a rapid pace. On October 10, of that same year, Fr. Dan announced the formation of a building planning committee. A few weeks later on October 25 the Archdiocese of Atlanta officially elevated the status of our mission to St. Mary Magdalene Catholic Church, a full-fledged parish. Fr. Dan Fleming was formally named our first pastor. In the spring of 2004, Fr. Dan announced the creation of our capital campaign. In June 2005 Archbishop Wilton Gregory persevered through the pounding rain to perform our official ground breaking ceremony. Later that summer, the barn which had held so many important and meaningful liturgies and celebrations was decommissioned, and eventually demolished to accommodate the beginning stages of the land development process. The actual construction on our new building began in November 2005. As our parish continued to grow and flourish, we added a noon Mass in the summer of 2006. Construction of our current facility was completed in January of 2007. 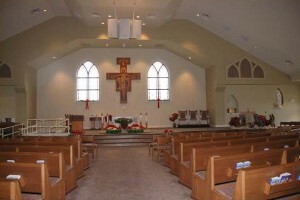 The first Mass in our new church was celebrated on January 27, 2007, and our building, worship space and altar were dedicated on February 8, 2007. Archbishop Wilton Gregory was the principal celebrant of our Mass of Dedication. Concelebrating with the archbishop was our pastor Father Dan Fleming, Father John Walsh of Holy Trinity, and many other visiting priests who came to Sharpsburg to see our new home. More than 650 parishioners and friends gathered and experienced this spectacular event. The construction of our new building included a worship space, an education wing, administrative offices and a parish hall. The dedication of our building served as the pinnacle of our journey, but we continue to grow in number and faith. On September 26, 2009 we celebrated our 10 year anniversary as a faith community with an outdoor Mass and parish picnic. Father Dan took this opportunity to recognize many of those parishioners who helped reach this landmark day, and many of us reflected on special events that were celebrated during our first 10 years. As our journey moves forward, we continue to celebrate many firsts. Most recently, with tremendous enthusiasm, we celebrated our first bilingual Mass on December 12, 2009. Fr. Fernando Molina Restrepo, along with Fr. Dan, celebrated the Mass on the feast of Our Lady of Guadalupe — along with more than 200 Spanish and English speaking parishioners and friends. Who is St. Mary Magdalene? To understand who she is, we must first understand who she is not. She was not a prostitute. She was not the mother of Jesus’ child. In the 6th century, Pope Gregory the Great gave a homily (that was not infallible) mixing up three different women in the Gospels: the anonymous woman in Luke who anointed Jesus’ feet with her tears and dried them with her hair, Mary of Bethany, the sister of Martha and Lazarus, who performed the same service in John, and Mary of Magdala, from whom Jesus cast out seven demons. The Pope assumed that the seven demons mentioned referred to the seriousness of her sins, and called her a prostitute, saying that Christ can forgive even the worst sinner. Scripture scholars of the 20th century debunked both the idea that these three women were the same Mary, and that the seven demons were a result of sinfulness. In his book, The DaVinci Code, Dan Brown popularized a modern theory that Mary Magdalene was married to Jesus Christ and bore him a daughter. This has no basis in any ancient document, but it has gotten quite a bit of interest, especially after the book and movie came out. The truth is that neither the Bible nor Sacred Tradition ever suggested that St. Mary Magdalene’s relationship with Jesus was any more than platonic. So that is who she is not. Who is she? St. Mary Magdalene should be best known for what we hear in today’s Gospel: a witness to the resurrection of Christ. All four gospels agree that she was present at the empty tomb, that Jesus appeared to her, and that she went back and told the apostles that Jesus was risen from the dead, earning her the title of “Apostle to the Apostles.” The fourth Gospel, according to John, expands the story as we see above. This is remarkable, because, in the first century Jewish culture, women were not able to testify in court, and therefore they were not credible witnesses, yet the Gospel emphasizes that Mary Magdalene was the first and primary witness to the risen savior. Furthermore, the New Testament mentions her 12 times, more often than any other woman except for the Blessed Virgin Mary. These true stories of St. Mary Magdalene remind us that women have an important role in the life of the church. She was one of several apparently wealthy women who traveled with, and supported, Jesus’ ministry. Many so-called Patriarchal religions, like Catholicism and Judaism, acknowledge that women are more likely to be devout believers and more likely to act upon their faith. Several rabbis and priests have even said that the ministry is limited to men because men need an extra reason to become holy! Saint Mary Magdalene is an example of God’s love and mercy, because Jesus cast out the demons plaguing her; and she is an example of steadfast faith and love in the face of the doubt of others. In the Gospel passage above, although she, like the apostles, was devastated by the death of Christ, she went to fulfill the Jewish task of preparing the body of Jesus for burial. Upon finding that the body was not there, she wept because she could not perform this last service for him. When she encounters the risen Christ, she is overjoyed and faithfully follows his commands. We can be like Mary by diligently seeking Jesus in our lives, even when he seems to be hidden from us, and when we find him, to respond faithfully to what he asks of us.